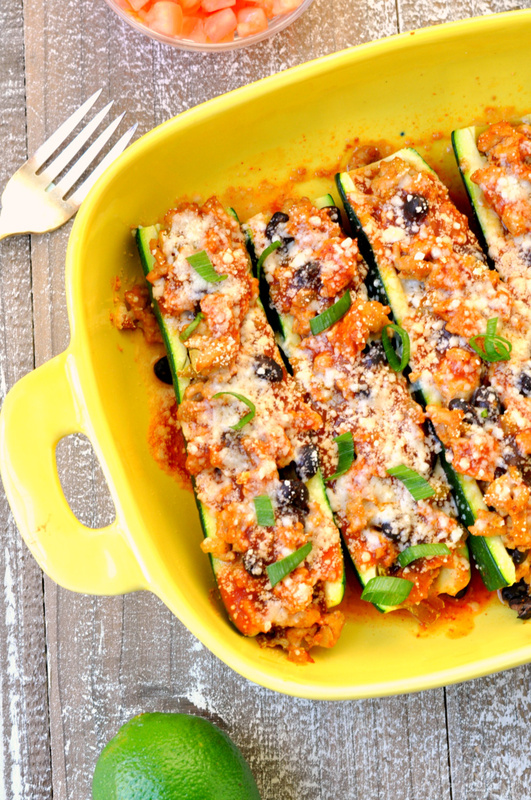 These stuffed zucchini are so quick and easy but are totally full of flavor. You can use green or red enchilada sauce based on your preference. The sauce on these enchiladas would be amazing too. 1. Preheat oven to 350 degrees. Spray baking dish with nonstick cooking spray and spread 1/4 cup enchilada sauce into the bottom. 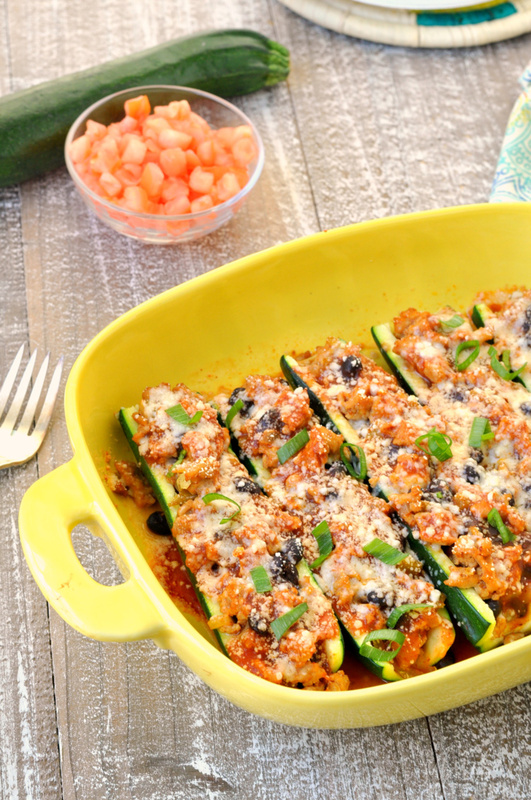 Place zucchini halves into dish. Set aside. 2. Heat oil over medium heat. Add chicken and onion. Cook, stirring to crumble, until done. Season with salt and pepper. Stir in 1/4 cup enchilada sauce and black beans. Remove from heat. 3. 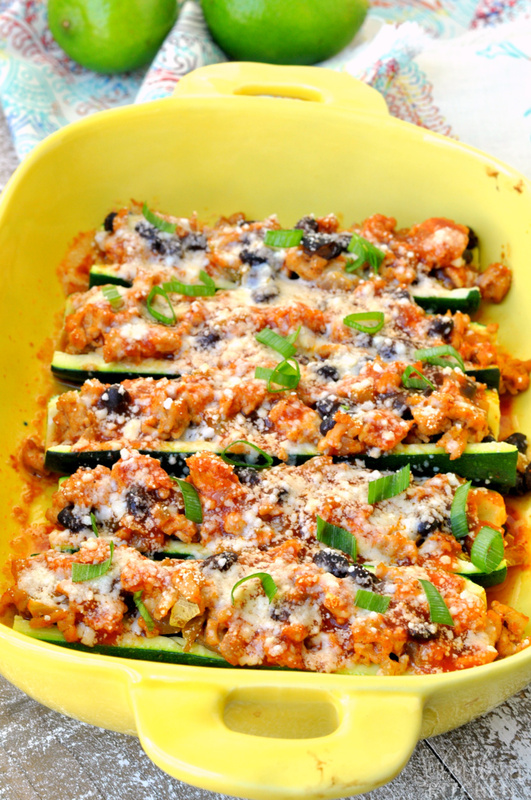 Spoon chicken mixture into each zucchini half. Top with additional enchilada sauce and shredded cheese. Bake for 10-15 minutes until cheese is melted and bubbly. I make this recipe with ground chicken but you could easily substitute shredded chicken, ground turkey, or even ground beef in it. I typically buy whatever is on sale and use it as my filling. I just love that this is a lower carb way to enjoy enchiladas and get my Mexican fix. Toss some chopped tomatoes on top and squeeze lime a little lime juice on them for an added flavor punch. What are your favorite weeknight meals? Is your garden overflowing with zucchini right now? Preheat oven to 350 degrees. Spray baking dish with nonstick cooking spray and spread 1/4 cup enchilada sauce into the bottom. Place zucchini halves into dish. Set aside. Heat oil over medium heat. Add chicken and onion. Cook, stirring to crumble, until done. Season with salt and pepper. Stir in 1/4 cup enchilada sauce and black beans. Remove from heat. Spoon chicken mixture into each zucchini half. Top with additional enchilada sauce and shredded cheese. Bake for 10-15 minutes until cheese is melted and bubbly.